Graham`s Past Life Regression Session aboard the Hindenburg, a German Airship which went up in flames and was destroyed by fire on May the 6th, 1937 in Lakehurst, New Jersey, USA. It carried 97 Germans and Americans, 35 of whom died. “It was as though someone else was speaking. He was too young to have a conversation but suddenly he was speaking in proper sentences. Then he seemed to snap back into baby mode. I didn’t know Graham knew what an airship was, and I hadn’t let him watch such horrific images on TV”. “He mentioned the airship once or twice after that, and if people asked him to repeat the story, he did so without adding anything to it. A few seconds after catching fire. Graham went quiet about what appeared to be his previous life after about the age of 5 or 6. And then when he was nine, Denise was watching a film about the fire that destroyed the Hindenburg, a German airship destroyed in a tragic fire on May 6, 1937 in Lakehurst, New Jersey USA. She called Graham into the room. “He ran in and took one look at the TV,” she remembers, then he said, “That’s my dream, that’s what I see”. Soon after this, in March 1994, Denise recorded a conversation with Graham about the airship in which he remembered more details. Graham said he could remember paper being on fire, falling off the airship, and people jumping out of a hole. Some people spoke in a different language, and some were speaking English. He thought he was about 16. Denise contacted a friend who put her in touch with the late Dr. Ian Stevenson, (Founder of the Division of Perceptual Studies) whom he knew was researching past lives. Dr. Stevenson came to visit Graham shortly after his 10th birthday, the boy’s memories of the experience were fading. Dr. Stevenson hypnotised Graham to try and get more information. Elevated Therapy International ® based in London at the time to do a regression with Graham who was now 19 years old. Spirit and Destiny is a magazine in the UK which writes about feel-good articles on all things alternative, designed to feed your mind, body and spirit with features on holistic health, natural beauty, emotional intelligence, celebrity spirituality and advice from experts in psychic phenomena. 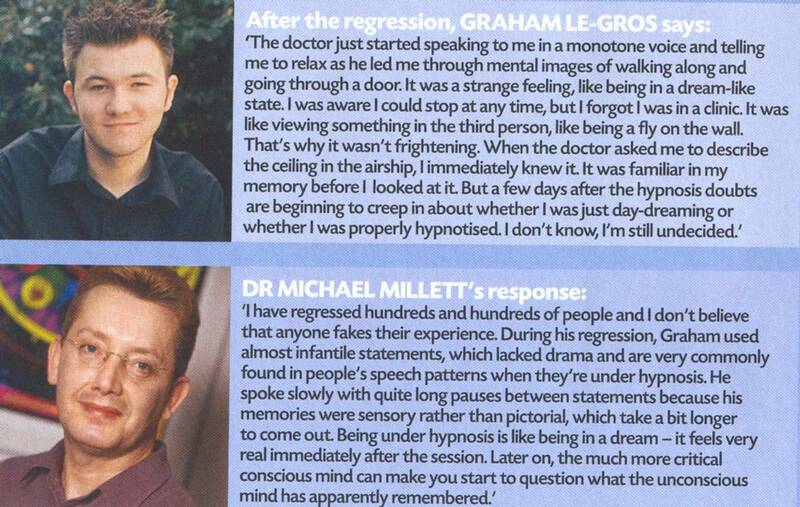 During Graham`s Past Life Regression session with Dr. Millett, Graham was able to describe the interior of the Zeppelin and it`s furnishings, sleeping area and the people in it socialising including what they were wearing, their mood and how they appeared on the passenger deck. He gave his opinion of varying individuals as an on-looker there with them, inter-mixing, observing and critisising. He appeared to be a passenger on the airship, wearing his best clothes and trying to make a good impression. He talked about the food that was served through the eyes of a passenger and the facilities on-board and being able to see the views below. He subsequently went on to describe the Hindenburg catching fire, the structure imploding and quickly becoming engulfed in yellow-red flames.